Heute ging im Redaktionsbüro des ESbloGs ein Beitrag aus dem Englisch-LK ein, den wir sehr interessant finden, denn es handelt sich um eine Filmbesprechung. Diesen Text mussten die SchülerInnen im Anschluss an die Filmanalyse in der Unterrichtsreihe „East meets West: postcolonial India & multicultural Britain“ schreiben. Dann hat der Kurs aus mehreren gelungenen Beiträgen die folgenden ausgewählt, die wir euch nicht vorenthalten wollen. The movie “East is East” is a priceless mixture of funny comedy and the serious culture clash between British society and Pakistani immigrants, taking place in the 1970s. In Salford, Manchester fish-and-chip shop owner George Khan expects his family to follow his strict Pakistani and Muslim way of living. However, his seven children and his English wife Ella born and brought up in Britain, increasingly regard themselves as British and start to reject their father’s rules and regulations. This rejection already becomes apparent in the first scenes of the movie, when the oldest son Nazir, after refusing his arranged marriage, gets excluded from the family by his father. As the story takes its course, again and again the children break their father’s rules by, for instance, secretly eating pork, having love affairs and by going to parties. Due to this and supported by the fact that George again is planning arranged marriages for his two other sons, towards the end of the movie the family finds itself in a crisis that even leads to a harsh fight between Ella and George. Another well-presented facet is the occurring racism in the movie. One neighbor of the Khan family is an admirer of Enoch Powell, the at that time leading anti-immigration flagship. In various scenes, the viewer gets to see him abhorring the Khans. However, the absurd thing is that one son of the Khan family named Tariq secretly dates the neighbor’s daughter and that Sajid, the youngest of the seven children, is the best friend of the neighbor’s son. Furthermore, another scene in which the blatant racism becomes evident is at the club where the bouncer only lets in British looking citizens. Having said that, it is save to conclude that this movie perfectly represents the serious problems of a multicultural family living in a society which believes in and sometimes even defends other, their own values. I strongly recommend this movie to everyone but especially to English courses, because it is a highly enlightening, entertaining as well as humorous movie and, what is more, a nice introduction to the topic “ethnic majorities in Britain”. Hardly ever would someone describe a movie dealing with racism and cultural tensions as humorous. 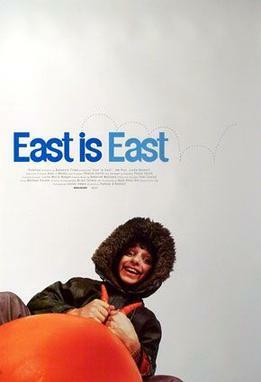 “East is East”, however, belongs to the very few exception. While the storyline, accompanied by excellent British humor, is intelligently told, the director does not fail to emphasize the serious side effects of two cultures clashing. Set in Salford in the 1970s, the movie focuses on George Khan, a Pakistani clutching onto his Muslim values, his British wife Ella and their six children, all born and raised in England. As Georg forcefully tries to make his children submit to Islamic rules, anger and incomprehension arise from both sites. Ella on the other hand is a woman of compromise and tries to mediate between the two fronts. Although the plot itself might seem appealing already, it is the delicate balance of humor and seriousness within the movie that makes it so interesting and captivating to watch. Funny scenes are often followed by scenes with a tense or even threatening atmosphere. The contrast that is created therefore is a refreshingly new approach to dealing with a topic most prefer to avoid. Noteworthy as well are Om Puri´s and Linda Basset´s achievements in acting their roles of Georg and Ella Khan as they do an outstanding job at conveying the depths of their characters. The characters in general are well rounded and their actions oftentimes encourage the viewer to reflect on their situation concerning to their cultural upbringing. One might criticize the fact that the movie lacks another Pakistani family as a comparison to the Khans since they do not represent all families of the same background. Having said all that, the movie “East is East” is highly recommendable for everyone who wants to get a taste of what it means to grow up in an interracial household and educate oneself on its difficulties. Wir finden, es hört sich nach einem MUSS für den nächsten Filmabend mit Freunden an! Danke für diese Einsendung!